“I think my best place in Brighton is the Pavilion Gardens. When I first moved to Brighton, I used to walk through the Pavilion Gardens on my way to work. I moved to Brighton in springtime and so all the flowers were just coming out and it was this really lovely, ‘Wow, I’m not in London anymore, I’m in this kind of magical place with this really mental Disney kind of style Pavilion.’ There is this really lovely old fashioned park with railings and I think it’s even got park keepers. 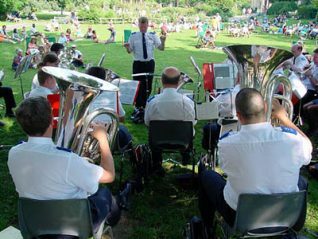 The Summer Concert Bands will once again start on the Pavilion Lawn on the first Sunday in June with the availability of deckhairs. The Council have announced it will be extending the Band season back into September for 2008. This will greatly please the many regulars that listen every week throughout the summer to the varied concert season. The South London Jazz Band conducted by Bob Bridges for the second year running have been a highlight with the Bacchus Wind Orchestra also a delight.